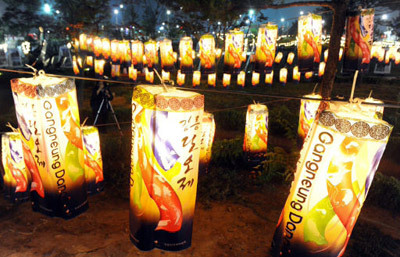 Korea’s annual Dano (단오) holiday, falling on May 5th of the lunar calendar each year, is one of the three most celebrated holidays in the nation. While Dano is one of the three major holidays together with the Lunar New Year (설날) and Chuseok (추석), its customs have been largely forgotten. However, the traditions and customs of Dano are well preserved in the town of Gangneung (강릉), where the Gangneung Dano Festival (강릉 단오 축제) has long been held annually. Over the years, a wide variety of special events have added zest to the festival, especially the experience that visitors get from the traditional ancestral rites ceremony. The traditional Dano folk game of geune ttwigi (swing; 그네뛰기) and ssireum (Korean wrestling; 씨름), the washing of hair in water infused with changpo (irides; 창포), the eating of surichwi tteok rice cake (수리취떡), and other more down to earth folk experiences also attract large throngs of visitors. In particular, the Gangneung Dano Festival is an international festival that UNESCO designated as a masterpiece of human tradition and intangible cultural heritage on Nevember 25th, 2005. The festive mood of the Gangneung Danoje Festival can be felt throughout the whole city. Visitors will be able to experience traditional performances for free and experience a variety of other time-honored cultural events. The cultural events begin with the offering of alcohol to the gods (Sinju Bitgi; 신주빚기) on April 5th on the lunar calendar, but the main events of the Gangneung Danoje Festival start with the Yeongsinje (the spirit-welcoming ceremony; 영신제) and the Sintongdaegil (신통대길) traditional parade on June 7th. At that point, the Daegwallyeong (대관령) memorial tablets and the sacred tree are placed in a shrine for a memorial service. After the rituals are complete, a procession accompanied by folk music winds its way to an altar prepared at Namdaecheon Stream (남대천). After the parade, the people proceed to Namdaecheon for the gut (shaman’s rite; 굿) and a mask drama play. Danogut is performed by Gangneung’s most well-known female shaman, who prays for the health and happiness of all the people at the festival. There are many different versions to this performance, with about 20 variations both minor and major. However, the basic form of speaking to spirits, dancing and chanting are found in each version. Performed only at the Gangneung Danoje Festival, the Gwanno Mask Drama (관노가면극) is a non-verbal traditional Korean mask dram where the lower class servants (nobi; 노비) wore masks of the upper class nobles (yangban; 양반). The drama is about the love of an upper class nobleman and the forces that interfere with his love. Ssireum is a traditional Korean wrestling for men. The wrestlers grab on to each other’s satba (a piece of cloth wrapped around the waist and legs; 샅바) and the match begins. The wrestler who gets the other on the ground first wins the game. 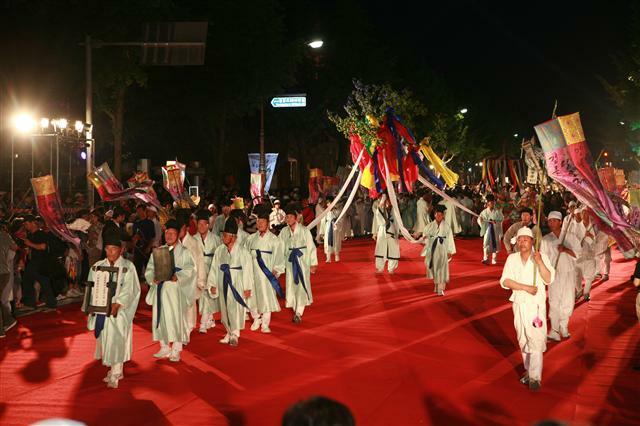 Both group and individual ssireum tournaments are held during the Danoje Festival. The group tournament is played by teams composed of Gangneung citizens while the individual tournament is open to all festival visitors. Geune is a traditional Korean swing where girls stand on the swing board and sway to the momentum. The swinging contest is one of the most popular folk games enjoyed by women during the Danoje Festival. A swing is hung on a tree and whoever can swing the highest is declared the winner of the competition. Other Dano customs can be experienced at the festival venue. Visitors can take part in such hands-on programs as making surich tteok (rice cakes made with a type of marsh plant) and sampling sinju liquor (liquor made a month before Dano to offer to the gods). In addition, wasing your hair with sweet flag-infused water, Dano fan decorating programs and other hands-on activities are available at the festival venue.